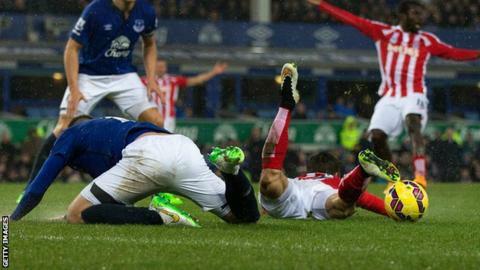 Bojan Krkic's controversial penalty won a fiercely contested fixture for Stoke as Everton were left counting the cost of injuries and missed chances. The Spaniard sprinted around James McCarthy and went down, with referee Lee Mason adjudging contact was made. Bojan scored the spot-kick - with Everton aggrieved that Jonathan Walters wasn't sent off for dragging back Leighton Baines moments earlier. The home side wasted openings and Phil Jagielka and Tim Howard limped off. Injuries to Toffees captain Jagielka, goalkeeper Howard and winger Kevin Mirallas ahead of a packed festive fixture list will give Everton boss Roberto Martinez as much concern as his side's seventh defeat of the season. Steven Naismith will miss Sunday's game at Newcastle after picking up his fifth booking of the season for a late challenge on Bojan - one of several feisty incidents at a wet and wild Goodison Park, with a total of 17 minutes stoppage time across both halves. Stoke leapfrog Everton into 11th place with their first clean sheet in 13 Premier League matches - marshalled superbly by a bandaged Ryan Shawcross, who had half-time stitches in a head wound. Martinez had criticised his side's "very soft" defending in their 3-0 defeat to Southampton last time out, but his changed backline - with 20-year-old John Stones brought in alongside Jagielka - only lasted 45 minutes. Ahead of the game, Stoke boss Mark Hughes said his squad had been focusing on "getting the details right" - highlighting individual errors he felt had undermined his side's campaign. Stoke conceded three clear first-half openings - one to Gareth Barry and two to Mirallas - but keeper Asmir Begovic was well-protected despite some late pressure. Most of the action came in the first half, with a crunching Glenn Whelan tackle on Stones setting the early tone for a blood-and-thunder encounter. But the game hinged on two quick-fire decisions from Mason. At one end, left-back Baines burst through Stoke's defence and was hauled back crudely by Walters. But the official adjudged that with Baines 45 yards out and other defenders giving chase, it wasn't a definite goal-scoring opportunity. In a pivotal 60 seconds, Bojan then latched on to a long Whelan clearance, held-off McCarthy, sped around him along the byeline and went down under what appeared to be minimal contact. "The red card isn't a debate. The moment he gives the free-kick it has to be a red, Leighton Baines is running into a central area in front of goal. "The game completely changed in that moment. "With the penalty, you know what striker is looking for. I don't think there's enough contact in that situation. "It then became a really difficult afternoon for us losing two very important players in Jagielka and Howard." "Bojan has done really, really well to get into the box and his back leg is clipped. Under those circumstances as a defender you've got to be really careful. It's a clear penalty." "We've done the same at City and we won at Tottenham. Our away form is better than our home form. Last year maybe we didn't have the tools to be a threat on the road. Our home form will resolve itself and we'll pick up points there." Match ends, Everton 0, Stoke City 1. Second Half ends, Everton 0, Stoke City 1. Delay in match Kevin Mirallas (Everton) because of an injury. Corner, Everton. Conceded by Erik Pieters. Geoff Cameron (Stoke City) is shown the yellow card. Romelu Lukaku (Everton) wins a free kick in the attacking half. Antolin Alcaraz (Everton) wins a free kick in the defensive half. Attempt blocked. Charlie Adam (Stoke City) left footed shot from outside the box is blocked. Assisted by Oussama Assaidi. Attempt saved. Romelu Lukaku (Everton) left footed shot from outside the box is saved in the bottom left corner. Assisted by Samuel Eto'o. Corner, Stoke City. Conceded by John Stones. Marc Muniesa (Stoke City) wins a free kick in the attacking half. Offside, Everton. Joel Robles tries a through ball, but Romelu Lukaku is caught offside. Attempt missed. Steven N'Zonzi (Stoke City) right footed shot from outside the box misses to the left. Assisted by Charlie Adam. Substitution, Everton. Samuel Eto'o replaces James McCarthy. Offside, Everton. Kevin Mirallas tries a through ball, but Romelu Lukaku is caught offside. Attempt missed. James McCarthy (Everton) right footed shot from more than 35 yards is too high from a direct free kick.